i'm always collecting new cookie recipes, especially holiday ones and this year i was so inspired by this beautiful recipe for candy cane chocolate cookies from the call me cupcake blog. not to mention just being inspired by her insanely gorgeous blog! but then december got a little too crazy and my inspiration waned a bit and the idea of having to convert the recipe and then test it, blah, blah...i know some of you get what i'm saying. so i went looking for a way to make my own version. 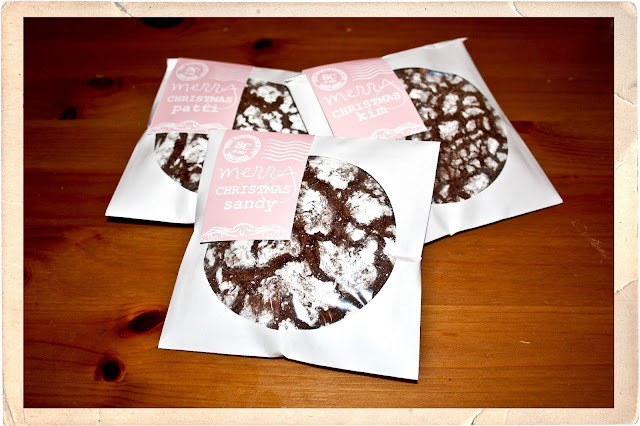 i started with the recipe for chocolate crinkles, a betty crocker and family favorite. you can find the recipe and picture here. i altered it just a bit and made them into what i'm calling minty crinkles. heat oven to 350. shape teaspoonfuls into balls. place about 2" apart on greased baking sheet. bake 10 to 12 minutes. chill between batches to make it easier to roll. do not overbake! cool completely on a wire rack. 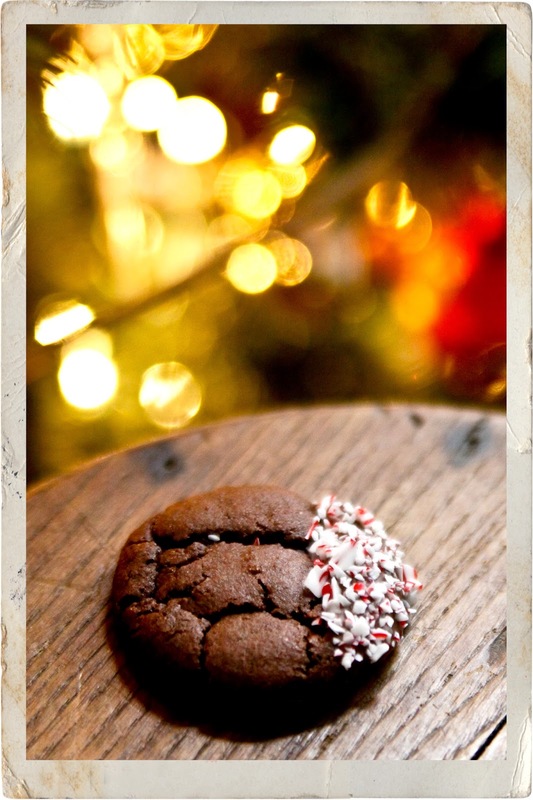 then dip in melted chocolate and crushed candy cane. return to wire rack to harden. makes about 6 doz. cookies. i'm sorry for my long absence. i had lots of fun things planned for december but then silly life got in the way and instead of being a fun celebratory time, it's been a couple of tough weeks. my grandpa has been ill and we were very worried. but things are getting better i'm hoping these last few days before christmas can be fun, with lots of cookie baking and holiday movie watching. and i wanted to share one little holiday project, homemade hot cocoa mix. it makes a great treats for friends and neighbors, a really fun hostess gift and it's really nice to drink on christmas morning. chop chocolate bars. whisk all ingredients together. in batches, pulse in food processor until chocolate is finely ground. store in an airtight container for 3 months. 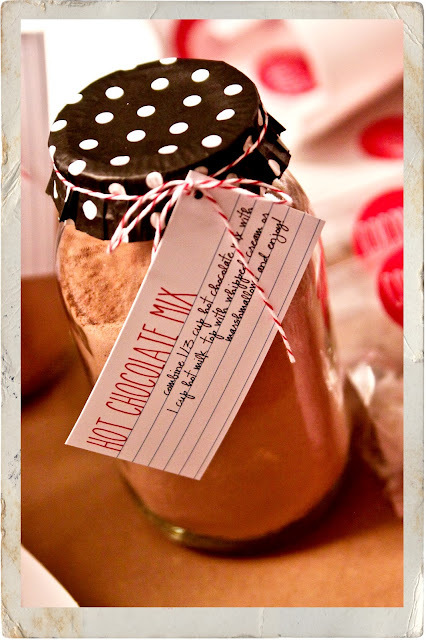 if giving as a gift, attach a tag with instructions to mix 1/3 cup with 1 cup with hot milk. this is the time of year where i start planning what kinds of holiday goodies i want to make for my friends & family, and of course the packaging is vitally important too! 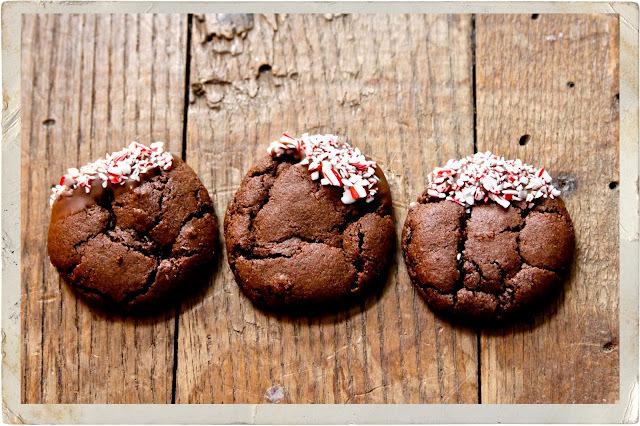 i have a crazy long list of cookies i want to make this year and no idea how i want to package them. and honestly i really should have thought about this sooner but i refuse to let anything as fun as holiday baking cause me stress. at least not until the last minute...hee hee! 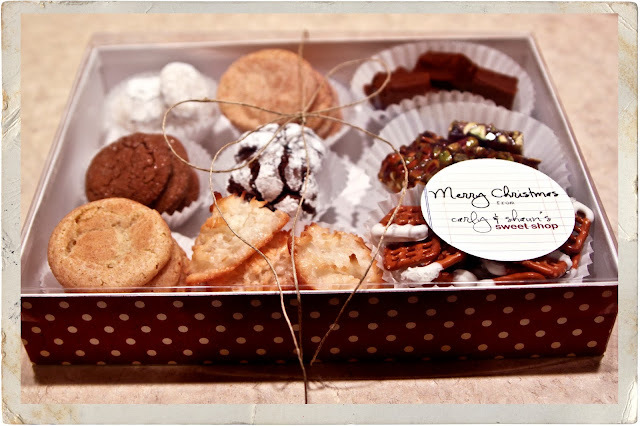 one of my all time favorites is using clear lidded boxes to give a variety box of treats. i start with a stationary box (find them here), cover the sides in decorative scrapbooking paper, place cupcake liners inside and fill them with a assortment of treats. then i glue a custom label to the lid and tie it all together with twine. i love this packaging so much i think i did it for a few years in a row. i also love using paper cd envelopes to hold one big cookie. 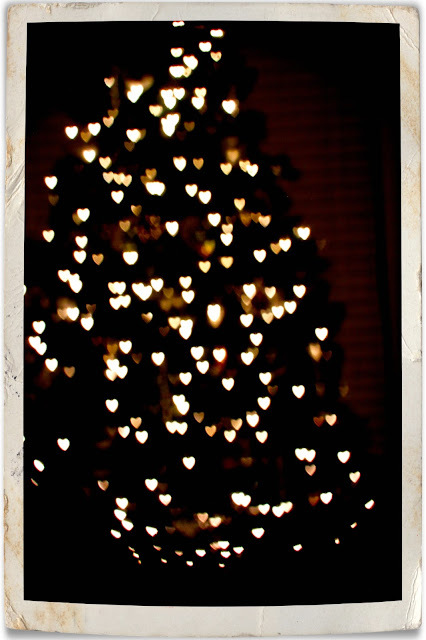 it's a great way to give a just little holiday sugar to someone. i wrap the cookie in plastic wrap to keep it fresh, insert in into the envelope, glue on a cute little label and adhere the envelope closed. and last year i made rolls of cookies for my sweet coworkers. i neglected to take a photo but here is the idea that inspired me. southern living suggested giving cookie dough in a cute roll with the recipe but i know my friends would rather have ready made treats and it's quite easy to wrap a dozen cookies into a parchment present. so what will i do this year? good question. glassine bags, mason jars, my favorite brown takeout boxes...i guess i better figure that out, my days are getting numbered! stay tuned for cookie packaging, part 2.